What do gender norms, innovation and trees have to do with each other? Gender researchers present findings from Indonesia and Kyrgyzstan that shed light on how gender norms shape, and are influenced by, forest and tree-based innovation processes. A new report based on case studies from the GENNOVATE: Enabling gender equality in agricultural and environmental innovation comparative qualitative research initiative presents findings from Indonesia and Kyrgyzstan that shed light on how gender norms shape, and are influenced by, forest and tree-based innovation processes. An estimated 1.6 billion people live in and around and depend in part or in full from forests for their livelihoods and well-being. Yet, the benefits from forests, trees and agroforests are unequally distributed across communities based on the gender, socioeconomic status, generation or age, and other social characteristics of their members. These inequalities make it even more difficult for already disadvantaged groups to benefit from new opportunities and innovations in agriculture and natural resource management (NRM). Innovation processes related to agricultural and NRM — whether centered on technologies (e.g. hybrid seed or mechanization) or institutions (e.g. new knowledge applied to NRM or ways of organizing production) — can reduce some of these inequalities, or they can exacerbate them. And gender norms, or the social ‘rules’ that determine appropriate behaviour for men and women, that maintain these inequalities can hinder women’s capacities to innovate. For example, norms that pose constraints on women’s mobility or labour or that make it socially inappropriate for women farmers to interact with men extension agents in some contexts, can make it difficult for them to try out and adopt new practices. The report, whose co-authors are from Bioversity International, University of Brighton, CIFOR, and University of Indonesia, contributes to the GENNOVATE comparative study. This is due to various factors, including migration, new markets, and new agricultural and NRM technologies, institutions, and practices. 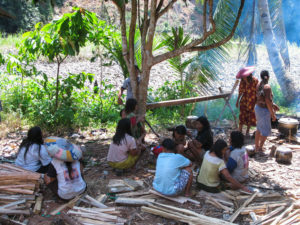 The newly released report Understanding gendered innovation processes in forest landscapes: Case studies from Indonesia and Kyrgyz Republic highlights how gender norms as well as local women’s and men’s agency (the ability to make and act upon decisions that shape the direction of one’s life) influence how forest dwellers experience these processes. In Indonesia, commercial investments in oil palm offer some new wage work opportunities, but supplant other forms of livelihoods and access to resources. 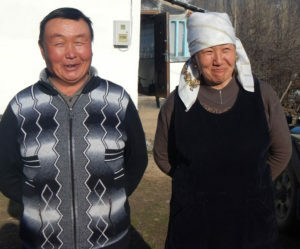 In Kyrgyzstan, new opportunities and challenges are emerging because of the country’s integration into a market economy and because of changes in forest tenure (ownership and access) regimes. In both countries, these changes have uneven effects for women and men, young and old, richer and poorer community members; and these different groups have unequal abilities to try out, adopt, or adapt innovations. The report highlights the importance of considering and addressing those differences and their underlying causes in project design and implementation. Gender norms and innovation interact dynamically, and both shift over time and place. Gender roles, rights and responsibilities can be renegotiated because of innovations that change what it means to be a woman or a man in a given environment. In light of these findings, how can we better support men’s and women’s ability to lead the lives that hold value to them? Carefully monitoring and mitigating possible forms of exclusion that can arise from innovation processes, which can reproduce inequalities. By Giulia Micheletti and Marlène Elias, originally published by Bioversity International. For more information, contact Marlène Elias. This research is part of the CGIAR Research Program on Forests, Trees and Agroforestry and is supported by the CGIAR Trust Fund.